"Sampath Speaking" - the thoughts of an Insurer from Thiruvallikkeni: Australian Open, Wawrinka; Cibulkova and..... 'hyphen' war ! Australian Open, Wawrinka; Cibulkova and..... 'hyphen' war ! The 19th edition of Chennai Open was sponsored by Aircel and was won by a man who was to hog more limelight later. After winning here, Stanislas Wawrinka won his maiden Grand Slam crown, overcoming an injury-afflicted Rafael Nadal to win a dramatic 6-3 6-2 3-6 6-3 in a match that will be remembered for a confusing and sometimes bizarre final three sets, with Nadal clearly hampered by a left lower back injury and seemingly on the verge of retirement in the second set before battling on. 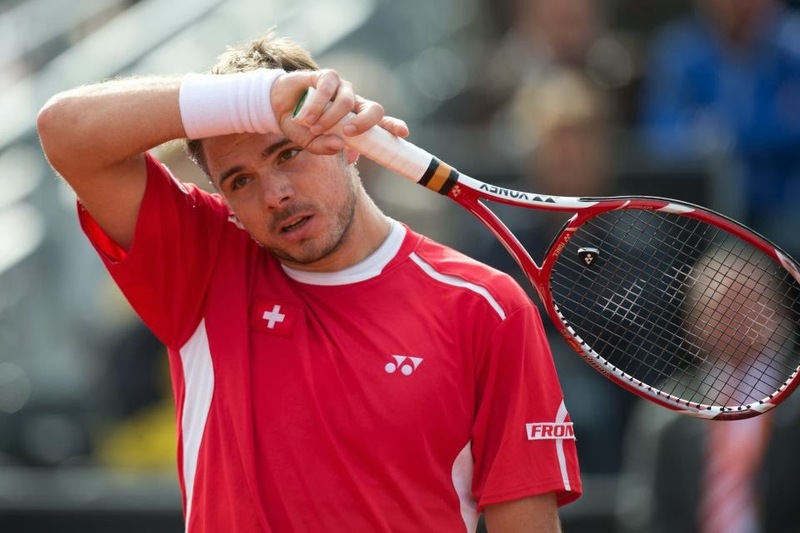 The victory was Wawrinka’s first over Nadal in 13 career meetings; the 28-year-old had not won a single set against the Spaniard earlier….. and the win will elevate Wawrinka to world No.3 . Wawrinka’s maiden Grand Slam success comes in his 36th major; only Goran Ivanisevic (37) has taken longer to win a first major crown. There is also a modest undercurrent of embarrassment after displacing Roger Federer as his country’s top-ranked player. Do you know or heard of the ‘hyphen’ war ? …. We all know that the hyphen (‐) is a punctuation mark used to join words and to separate syllables of a single word. The use of hyphens is called hyphenation. The hyphen should not be confused with dashes (‒, –, —, ―), which are longer and have different uses, or with the minus sign (−), which is also longer. At Australian Open, Chinese Li Na cruised past Dominika Cibulkova in straight sets. Li was 4th seeded and eased through her opponents. The loser, Cibulkova is the first Slovakian ever to make a grand slam singles final. Dominika Cibulková (1989) is a Slovak, known for her quick and aggressive style of play. She has won three career singles titles. Her career-high ranking of world no. 12 was achieved in July 2009. Dominika Cibulkova is proving that, at the Australian Open anyway, size doesn't matter. Cibulkova thumped Agnieszka Radwanska in the women's semifinals. The 5-foot-3-inch Cibulkova needed a mere one hour, 10 minutes to dispose of the world No. 5. Cibulkova is an anomaly in the current generation of women's tennis. A sparse three women in the top 100 -- American Lauren Davis and Japanese duo Misaki Doi and Kurumi Nara -- are shorter than Cibulkova. Last year, the women's grand slam winners were all 5' 6" or taller. Li is just under 5' 8". ~ and since the Open Era began in 1968, no player shorter than 5' 3" has claimed a major title. !!!. "It's not about how tall you are," Cibulkova, 24, told reporters. "It's just you have to really believe in it. There is nothing more important than this." Moving away from Tennis (Love All) to War (Love None)…. ~ the Hyphen War (literally "Dash War) was the tongue-in-cheek name given to the conflict over what to call Czechoslovakia after the fall of the Communist government. The official name of the country during the last 30 years of Communist rule had been "Czechoslovak Socialist Republic" (CSSR). In December 1989—a month after the Velvet Revolution—President Václav Havel announced that the word "Socialist" would be dropped from the name, and the country would be known as the "Czechoslovak Republic"—its official name from 1920 to 1938 and from 1945 to 1960. However, Slovak politicians felt this diminished Slovakia's equal stature, and demanded that the country's name be spelled with a hyphen (e.g. "Republic of Czecho-Slovakia" or "Federation of Czecho-Slovakia"), as it was spelled from Czechoslovak independence in 1918 until 1920, and again in 1938 and 1939. President Havel then changed his proposal to "Republic of Czecho-Slovakia"—a proposal that did not sit well with Czech politicians who saw reminders of the Munich Agreement. As a compromise, on 29 March 1990 the Czechoslovak parliament resolved that the country's long name was to be spelled without a hyphen in Czech (Československá federativní republika) and with a hyphen in Slovak (Česko-slovenská federatívna republika). This too was found to be unsatisfactory, and less than a month later, on 20 April 1990, the parliament changed the name again. Although the Slovaks were demanding a hyphen, Czechs called it a dash. Although there is a clear difference between a hyphen and a dash in Czech and Slovak spelling, Czechs usually use the term pomlčka for both; Slovaks differentiate them. Nonetheless, English language media generally refer to the conflict as the "Hyphen War". While the Hyphen War was not really deserving of the name "war", it demonstrated that there were differences between Czechs and Slovaks regarding the identity of their shared country. Over the following two years, more substantial disputes arose between the two halves of the federation. In 1992, Czech and Slovak politicians agreed to split the country into the two states of the Czech Republic and Slovakia—the so-called Velvet Divorce—which became effective on 1 January 1993.